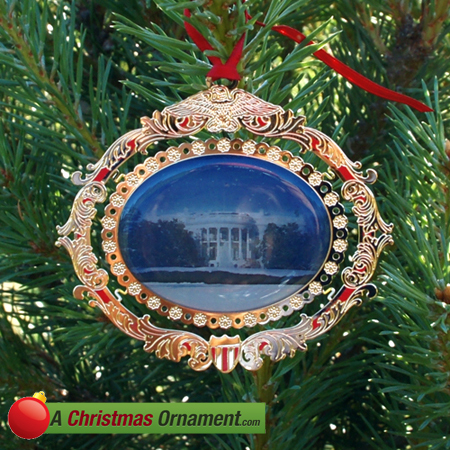 Christmas Ornaments Made in USA - 2010 White House South Portico Ornament - A Christmas Ornament Co.
A wonderful way to celebrate the holidays is with a patriotic ornament from Washington, DC, the Nation’s Capital. South Portico was added to the White House around 1824 and was true to the original Federal design. Although the East and West wings of the White House are shrouded in trees and only the portico remains un-shrouded, at one time the entire White House grounds were bare of trees according to historical photographs. The South portico is often used as an entrance for visiting dignitaries after a ceremony on the South Lawn and the south side of the house is reportedly where the President’s bedroom is. The red ribbon surrounding the ornament is symbolic of supporting a more conservative republic.